A Darragh Porter hat-trick helped DUFC to victory in the final of the Fraser-McMullen Cup. If pathetic fallacy was not indeed a fallacy, Sunday’s under-20s All-Ireland Final between Dublin University Football Club (DUFC) and Clontarf would have been an absolute mess, as five minutes of driving wind and rain were liable to give way to four minutes of blissful sunshine, the weather darting arbitrarily between the two extremes. In any event, the game proved to be more straightforward, if still exciting. DUFC, pouring out of the blocks, were immediately in the ascendancy against a Clontarf side seemingly unprepared for the speed and energy that Trinity threw into their play. Just minutes after the starting whistle blew, the students were within spitting distance of Clontarf’s try line. Clean, snappy passing set up attack after attack that hammered Clontarf’s line, hardly giving them time to respond to the next of Trinity’s manoeuvres. After a quick removal of the ball from maul out to the wing, DUFC’s Darragh Porter got the first try of the game, crashing into the corner and setting up a difficult, and eventually missed, conversion. Barely five minutes later, after a pair of dazzling runs by Rob Russell and Dan Sheehan, Porter was set up once again to touch down for another try, which once again went unconverted. Twenty minutes in DUFC were certainly enjoying the fruits of their efforts, dominating possession and 10-0 up. Trinity’s energy, however, sometimes lapsed into recklessness and inattention to the referee’s calls. Because of this, Clontarf were offered several avoidable penalties over the course of the game. The first of these was conceded at the 23-minute mark, after a Trinity player failed to roll away, and allowed Clontarf to earn their first points of the game. Far from deterred, within moments DUFC were back on the offensive. Assertive runs and assured handling between captain James Hickey and Patrick Nulty set Sheehan up for Trinity’s third try of the game 28 minutes in, and the first one successfully converted by James Moriarty, putting the score at 17-3. In one of the game’s many hints to pathetic fallacy, a brief and welcome appearance by the sun on the pitch coincided with a golden opportunity for Clontarf. Another penalty may not have hit the mark, but a DUFC knock-on gave Clontarf a scrum right on Trinity’s try-line. The students were suddenly, and for the first time in the game, on the defensive, a situation that Clontarf were eager to exploit. The side’s co-ordination had also been noticeably tuned up by this phase of the game. Where promising runs by Clontarf wingers had gone unsupported before, now the whole team were behind them in a frantic and protracted attempt to push over the line. Though they held play deep in Trinity’s half, they were not to be rewarded and had to make do with two more penalties before heading into half-time, making it 17-9. The second half saw the return of the discipline and aggression that had characterised DUFC’s early first-half exploits. Just three minutes in and after a great counter-attack by Trinity, Russell delivered them another try. Even though it didn’t set up an easy conversion, Moriarty followed through with an impressive kick and brought the score up to 24-9. Despite Clontarf’s best efforts to put Trinity back on the defensive, and they were indeed good, they struggled to maintain a firm grip on the ball. Perhaps it was the shower of rain that had soaked the pitch at the start of the second half, but ball just didn’t want to stay in the hands of Clontarf’s players, and as the ball bounced off and between them DUFC were given more than enough chances at interception and turnover to fend off their attackers. Sheehan eventually broke through Clontarf’s ranks and pulled off a fantastic run that would eventually set Porter up for his third try of the game. Unconverted, this brought the score to 29-9 by the 58-minute mark. While Clontarf were certainly gaining momentum on their offensive efforts at this point, it wasn’t enough to stop another try by Reuben Pim in the 67th minute, and the missed conversion, which was cruelly blown off course, would have been of little comfort to the struggling side. What was of some comfort was a first try of the game, scored in the final few minutes, which with a conversion brought the score to 34-16. DUFC snapped back with a converted try of their own just minutes later, scored by John McKeown, and widened the margin. 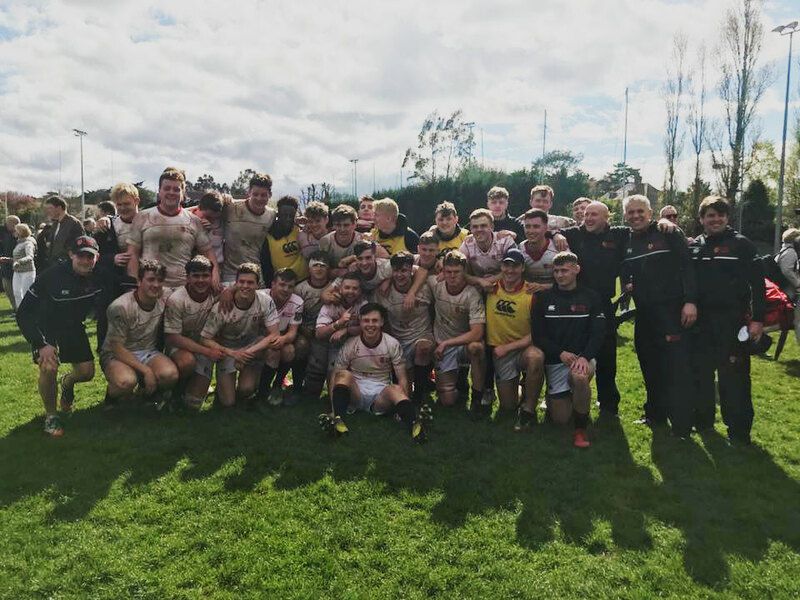 A final burst of energy led to a well-earned try by Clontarf in the game’s dying moments, and though it may not have done much to affect their fortunes, it did put a smile on their players’ and supporters’ faces. The whistle blew on a 41-21 victory to Trinity.